Syncing music from your iPhone or iPad across computers has got to be one of the least enjoyable experiences in Apple's computing ecosystem. The advent of iCloud was meant to lift the headaches of this cord-reliant process into the upper atmosphere and usher in what the late Apple guru Steve Jobs called the post-PC world. The main problem until now: You can have different songs on different computers and devices, and they never seem to be where you want them. With iCloud, a faraway bank of computer servers known as the cloud remembers what you've bought on iTunes and pushes them to you wirelessly on all your Apple devices. The promise is pretty sweet - especially with the basic service free. In about a week of tests, using both high-speed Wi-Fi connections and regular 3G cellular networks, the system did just what Apple's Internet services boss Eddy Cue said it would: "It just works." Songs I purchased on a Windows version of iTunes showed up on an iPhone 4 in about 15 seconds using AT&T's cellular network (although I had to tinker with the settings to turn automatic downloads on). When songs appeared as incomplete downloads, I could still start playing them as the downloading continued. Free book samples popped in just as fast as songs, but TV shows required both Wi-Fi access and manually tapping the cloud button beside each episode. Plus, the TV show service had a glitch. I'm still waiting for the iPhone to register "Hell on Wheels," an upcoming AMC show I downloaded for free on my PC's iTunes. Movies won't work in the cloud system at all - at least not yet, thanks to Hollywood's convoluted system of rights for premium pay TV partners such as HBO. If you don't have the new iPhone, the 4S, you'll need to install the latest mobile operating system, iOS 5, a free update that will require hooking up the device to a computer. You need an iPad, an iPhone 3GS or 4 or an iPod Touch released in September 2009 or later. You'll also have to update the computer's iTunes software to 10.5, which is also free. Mobile systems before iOS 5 will still allow you to see your purchases and download them wirelessly; it just won't happen automatically. Still, iCloud is not a complete wireless solution. You've likely acquired music somewhere other than iTunes, either online at places such as Amazon.com - especially when Amazon has discounts - or from CDs you bought or borrowed. To cover that likelihood, Apple Inc. has iTunes Match, a $25-a-year service that aims to match every song on your computer against the 20 million it has in the cloud. It will upload what it can't match from your computer. Then you'll have access to the entire collection wirelessly on demand - at least when you have a Wi-Fi or cellular connection. The service, which works only with music, will be available in the U.S. at the end of October. ITunes Match makes sense for a few reasons. For one thing, most songs on people's iPhones, iPods and iPads didn't come from iTunes. Second, lots of people have more songs on their computer than they can fit on their iPhones or iPads. And iTunes Match offers storage for up to 25,000 songs, which I've calculated is about the same as 100 gigabytes of memory. That's a lot more than the 5 GB that iCloud gives you for free. ITunes Match will also upgrade some of your iffy, low-res song files to iTunes quality if there's a match. You can get away with paying for iTunes Match just once, but you may have to pay instead for cloud storage, which can wind up costing you more. Apple charges $20 a year for 10 GB, $40 for 20 GB and $100 for 50 GB of storage space. 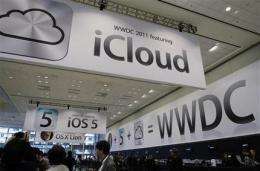 Whether iTunes Match will prove as easy to use as iCloud is unclear. I have my doubts given all the complaints people have had with cellular network coverage. Apple says the service will stream your cloud songs to you instantly, store a copy of your most-played songs automatically and allow you to download whichever songs you'd like onto your device for offline playback. My doubts about this kind of streaming service are based on my experience testing Amazon.com Inc.'s Cloud Player, Google Inc.'s Music Beta and all-you-can-listen music subscription services such as Rhapsody and MOG. Amazon's and Google's systems are free, although for Amazon you'd have to pay for extra cloud storage beyond 5 GB, while Google caps your storage at 20,000 songs, which pencils out to a generous 80 GB. Subscription services typically cost $10 a month. Both Amazon's and Google's cloud services do essentially the same thing as iTunes Match for smartphones that work on Google's Android system. The exception is that they require you to install a small program on your computer to upload everything you have into your cloud. With iTunes Match, you only need to upload the files Apple doesn't already have. Uploading all your music can take a long time, so I'd recommend starting it at night and checking on it when you wake up. Google's uploader also sits nicely in the background and pushes any new songs fed into iTunes into the cloud automatically. When you're done, you can install apps on Android devices to see your content. Amazon's and Google's apps both have buttons that allow you to play songs by streaming them from your personal cloud locker. The problem with streaming is that cellphone coverage can be spotty. I found that at least for Amazon's system, songs that I streamed paused for long periods while I was driving. This definitely kills the mood. Also, data plans can rack up big overuse charges, so I'd probably avoid the luxury of streaming or downloading my cloud songs outside of a Wi-Fi zone. Both Amazon's and Google's services made it fairly bothersome to download songs from cloud storage. Google has a checkbox to make songs available for offline listening, but you won't know until it's too late whether it worked or not. I found, for example, certain songs from The Black Eyed Peas album "The Beginning" weren't available for offline listening even though I "pinned" the album for this purpose more than a day earlier. Amazon doesn't allow streaming playback while downloading. Both services randomly had periods where downloading was not available. And that's even after carefully tinkering with the settings of both apps. The final problem with streaming is the lag between pushing play and having a song start, something that doesn't occur when the file is on the device already. Having said all that, my favorite way of getting music is through the all-you-can-listen subscription plans. There's not a lot of worry involved, and you don't have to remember what's in your collection. You can just search for a song, stream it right away and simultaneously download it to your device if you know you'll have intermittent cell coverage ahead. New releases are available every Tuesday. On the other hand, buying music by the song or the album can be cheaper than paying $10 a month for an unlimited subscription. I've also found that subscription plans don't have a lot of international artists. For instance, I couldn't find my favorite Japanese pop band, Southern All Stars, other than a tinkly music box tribute album on Rhapsody, despite its huge library. Ultimately, cloud storage is the way of the future. CDs saved on shelf space, and now cloud storage eliminates any remaining physical burdens. But playback will remain an issue as long as cellphone networks are unable to cope with the massive demands on the system. Because of that, I just don't think iCloud or other cloud music systems will replace the cord just yet.